Yes! You can now have your t-shirt graphics printed even bigger than before. To get started download the jumbo t-shirt print template for DTG printing with Print Aura. 2. No white underbase for t-shirt printing. Don't want an underbase on your DTG t-shirt print? No problem. 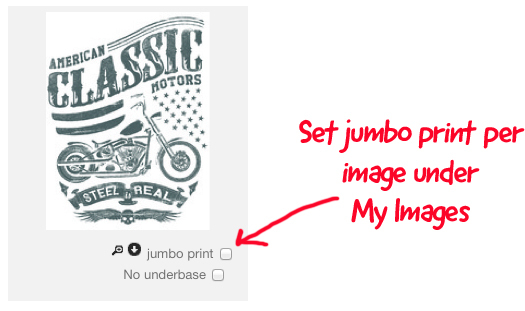 You can now set individual images to be printed with "no underbase". What does this mean? Well with DTG printing a white underbase is typically applied to all garment colors except white. Then the color layer is applied on top. Adding that white underbase makes it so the colors will be more vibrant. So why would you want to not include an underbase? Some of our clients prefer no underbase on certain print jobs because 1. It is a softer print without the underbase (the underbase makes the print kinda sticky). 2. No underbase prints will appear more faded/washed. This type of sub-dued or vintage look. is popular when printed on a sport grey colored t-shirt. This feature of removing the underbase is not for everyone and not for all art/shirt combinations but for our power users who requested it, it is ready to roll. Please note if you select no underbase then your design will not have any white printed. You will also be charged for the "white print price" regardless of the color shirt you choose to print it on.